The Wayne County Soil & Water Conservation District is honored to complete yet another season of partnership with all the agriculture stewards of Wayne County. In 2014, we have covered over 10 acres for erosion control, completed 5 barn yard systems for water quality benefits, helped over 15 farms complete farm plans and aided farms in procuring over 6140 feet of water management supplies. 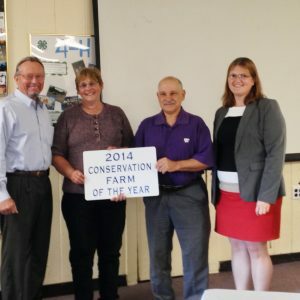 Each year the District honors an individual as an Agriculture Environmental Steward and a farm as the Conservation Farm of the Year who is dedicated to conservation and environmental sustainability for the community as part of the NYS Agricultural Environmental Management Program. At this year’s Agricultural Economic Development Board’s Agriculture Leadership Tour, Commissioner Richard Ball was the key note speaker with comments on the importance of agriculture to the NYS economy as a whole. 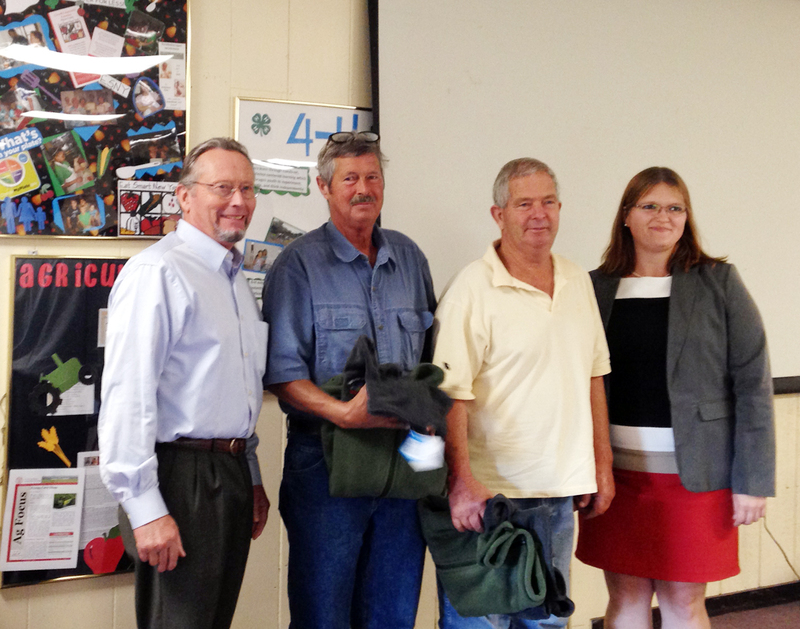 He also assisted the District with presentation to the award winners of 2014. An agricultural steward is someone who is dedicated to being agriculturally minded, environmental and conversationally sound and having the balance for them both economically. This award is given this year to a brother team, Larry & Roger Arliss of Galen, NY, who have for 30 + years have offered technical assistance and knowledge to many farms and the next generation of their own, miles of implemented Best management practices for Water Quality, tons and tons of natural resource use and restoration, they have participated on several ag leadership committees such as USDA’s County Office Committee and the Wayne County Agriculture Economic Development Board, volunteered to host workshops at their farm to demonstrate how soil health can be obtained with minimal tillage. 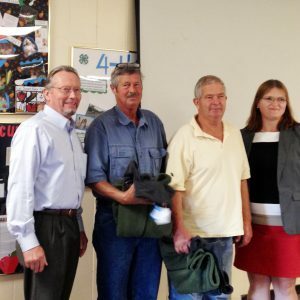 They were the forefront of leadership for conservation tillage in Wayne County and we can thank them each individually for numerous actions that have improved the agricultural community. When the call went out for nominees this year, we received several, however these two names reoccurred and after contemplation of their efforts over the years, it was to the committee’s recommendation that without their own dedication to each other, their individual conservation and community efforts wouldn’t have been possible. While being a great steward is sincerely the hardest thing, conservation farming wouldn’t be possible without the daily hard work and dedication of a farmer. But there is more to that. There is passion of a farming team to make a farm continue to thrive in a never ending highs and lows of the economy. Brian Manktelow of Manktelow Farms of Lyons, NY was the first farm to receive it in the 2004 and there have been several farms that have gone over and above to make great strides in stewardship and conservation on their own “little pieces of heaven” with the years to follow. 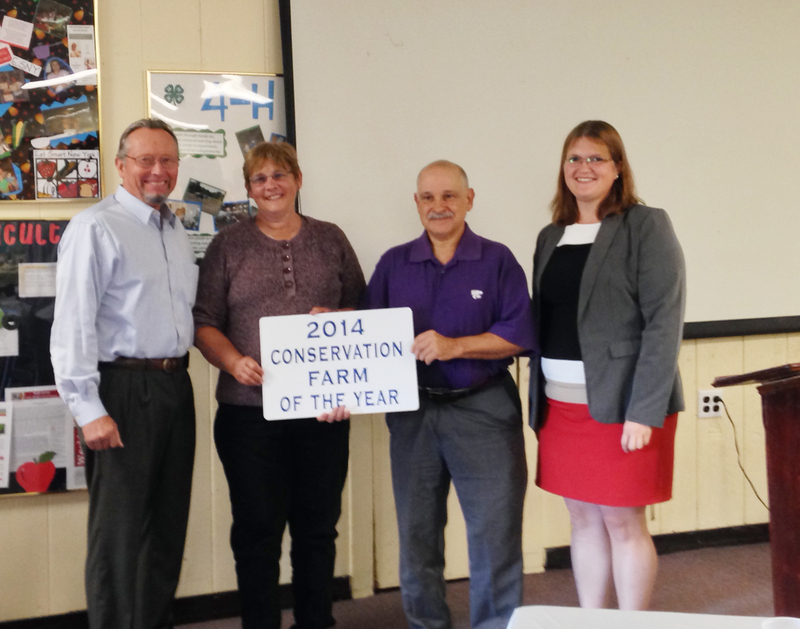 The 2014 Conservation Farm of the Year award this year will go to Hidden Canyon Farm, owned and operated by Steve & Susan Olson, of Lyons, NY. After spending their professional lives in the northern Midwest, this farming couple moved their agricultural family back to Wayne County where Steve grew up to take over the family farm some 30 years later. Now an operational cow calf pair, the family educates the community, fellow commodity neighbors and the next generation about quality of beef products and the passion of caring for their farm. Every time someone meets with this farming couple, they are greeted with a grand smile and grin, along with all the positive impacts of the new and exciting opportunities going on at the farm! There is true appreciation and honor in the passion that this couple has for their land and animal operations. This farm couple has spent the last several years raising beef, goats and the next generation of agriculturalist here in Wayne County. They have conservation dedication and are stewards of the land because of the many demonstration systems and plans in place to mitigate the loss of nutrient and safety for water quality. Their cow/calf operation and multiple custom crops helps cover the diversification of the farm feed and financial needs while continuing to provide quality products and continues to provide outreach. Wayne County agriculture is made up of extraordinary people that continue to demonstrate that passion and hard work continue to thrive all year round. In the peak of harvest, do you have a farmer that you can call your own? For other information about Wayne County Soil & Water Conservation District programs please visit us on the web at www.waynecountynysoilandwater.org or call our office at 315.946.4136.